Trinity Mirror is the largest national and regional news publisher in the UK. Founded in 1903 as The Daily Mirror (now a UK tabloid) it slowly transitioned into a publishing company now known as Trinity Mirror plc. It still publishes The Daily Mirror as well as The Sunday Mirror and People, The Scottish Sunday Mail and The Daily Record. Located in Canary Wharf, London, their goal is to enlighten their readers with vital knowledge and insight and to become an essential part of people's daily lives. The publications will be available online for the first time in the newspaper section on our website and our sister site, the British Newspaper Archive, giving you the opportunity to search and explore a wide range of historical UK publications previously inaccessible to the public. The project will contribute significantly to our 20 th century newspaper holdings and extend our geographic reach with over 150 local titles from across the UK. Once complete, the Trinity Mirror titles will nearly double the total newspaper holdings in our collection. This will, in turn, provide even more opportunities for you to explore history as it has happened. 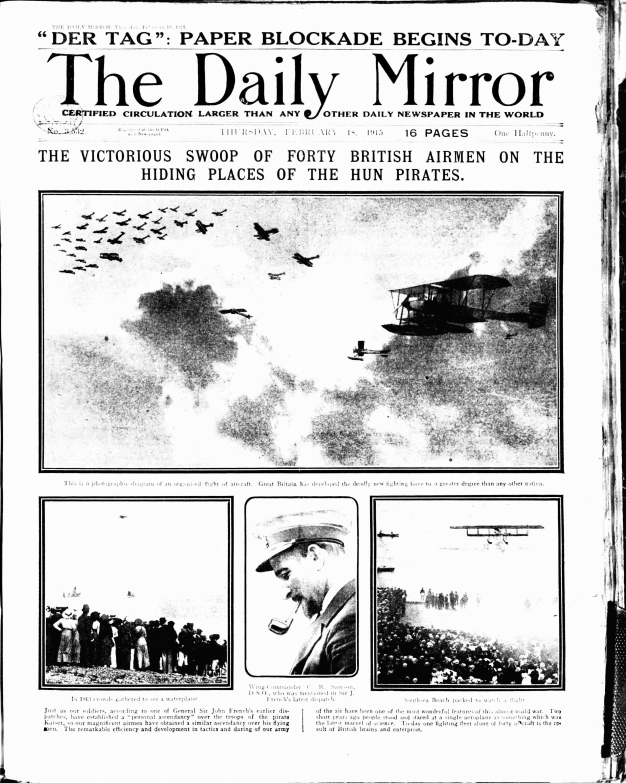 Daily Mirror, 21 January 1916 Image © Trinity Mirror. Image created courtesy of THE BRITISH LIBRARY BOARD. Digitisation is underway with up to 100,000 pages being scanned each week. New material from the Trinity Mirror titles is now available to search, including a variety of publications covering Birmingham and the Midlands as well as additional issues of The Daily Herald. The two-year programme builds on an existing partnership that has already resulted in the digitisation and online publication of upwards of 160 Trinity Mirror titles. These titles include significant coverage of both World Wars and the first publications of The Daily Mirror and The Daily Herald.